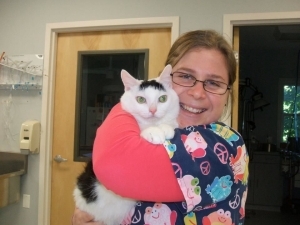 Sara is one of our full time CVT's (Certified Veterinary Technician). She graduated from the Veterinary Technician program at Camden County College, and has worked for many years as a technician. Sara is our resident Beagle lover, and has two black lab mix dogs named Earl and Stanley, who you can sometimes find at the hospital on Fridays playing with their best friend, Olive. In her spare time, she enjoys camping and fishing with her husband, Mike.